This fall, our middle RE class (primarily 2nd-6th graders) will form a chapter of Dumbledore’s Army (from the Harry Potter stories by J.K. Rowling). 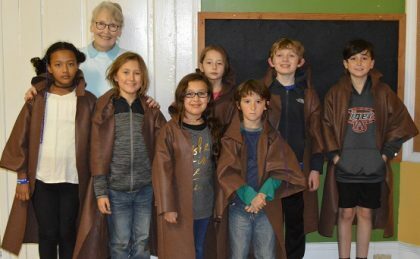 This UUA-approved curriculum encourages the exploration and development of children’s awareness of social action through the fighting of “horcruxes” (for example, hunger, poverty, animal cruelty, and others). More information about the year ahead is forthcoming.